The Lost Planet 2 demo went up yesterday, and most of the Co-Optimus staff rushed home to play it as soon as possible. Our impressions of the demo range from giddiness (me) to grumpiness (Mike) and everything in between. We're interested to know: what are your thoughts on the demo? Did it sell you a copy of the game? Or save you $60? The demo was hectic and didn't improve the series controls, which are splashy but serviceable. The precision aiming zoom cannot be re-mapped; that's frustrating. Overall, though, I had fun with it. I'm looking forward to a good mix of close-quarters firefights and epic creature battles. I thought the demo still felt like Lost Planet, but might have been a poor representation of the sequel. That being said it's obvious to see how much depth co-op is going to add to the game, and I really like how "fresh" the gameplay is compared to the other first and third person shooters out there. The demo didn't do anything for me- the controls felt too loose, you could suddenly drown yourself, and despite there being tutorial screens strewn throughout the demo area, it's sort of difficult to get a grasp of the mechanics without frustration. As I've said elsewhere, it feels like what I would imagine a shooter version of Monster Hunter would play like, and not in a good way. The co-op aspect of the game was enjoyable, especially the 3-player drivable mech. Though, the controls were a little wonky, the menu wasn't the easiest to maneuver, and the dark screen made things hard to distinguish from one-another. I played through with 3 other co-optimus members, and we finished the demo, but not before a lot of "are we actually doing any damage to that thing?" 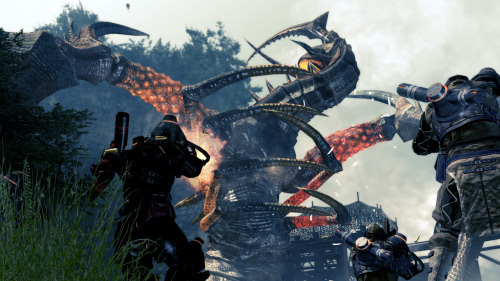 I played through only a little bit of the PC version on Lost Planet, but this demo was far more impressive to me. The monster is epic, and going inside him was suitably icky. The demo sold me on the game! Page created in 0.2829 seconds.